FAA has updated AC 61-65E: Certification: Pilots and Flight and Ground Instructors with Change 1. This AC “Provides guidance for pilots and flight instructors on the certification standards, written test procedures, and other requirements contained in FAR Part 61.” It also includes recommended logbook endorsements that CFIs should use when logging instructional flights, endorsing students for solo and cross-country flights, and preparing customers for practical tests. FAA published AC 61-65F on February 25, 2016, which includes changes to the procedure for obtaining a student pilot certificate. The update, published January 6, 2014, includes important changes to the requirements for the ATP certificate and other revisions, which are outlined in the record of changes. 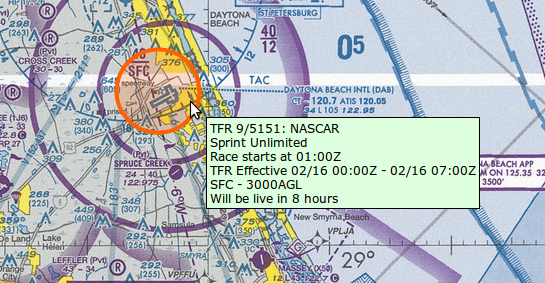 SkyVector.com just announced that it depicts the so-called stadium TFRs (those covered by FDC NOTAM 9/5151). More information here. On a side note, although SkyVector.com technically remains an unofficial source of charts, weather, etc., it is linked as a source of charts at the Lockheed-Martin FSS web portal. By comparison, there are 5,794 ILS, LOC, NDB, and VOR approaches (again, not counting CAT II, CAT III, and other procedures that require special training, equipment, and authorizations).  Here’s a pie chart that shows the relative shares of different types of instrument approach procedures in the U.S.
I’ve created a YouTube playlist, Stalls and Spins, that features videos I recorded while demonstrating a variety of stalls, incipient spins, and spins. Most of the videos were captured while I flew the Extra 300L; a few show stalls in the Beechcraft A36. Many pilots are uncomfortable with stalls while the wings are banked, typically because they’re concerned that, at the stall, a wing will drop, and the airplane will depart into an incipient spin. In this video, I demonstrate stalls in an A36 Bonanza while banking at 45 and 30 degrees. As you can see, if the turn is coordinated, at the stall, the nose drops toward the horizon, but the bank angle remains essentially constant. Because the airplane is turning, the stall occurs at an airspeed higher than it does in a straight-ahead, wings-level stall. An airplane in a level turn is accelerating (changing velocity because it’s changing direction), and therefore experiences more than 1G. In non-aerobatic aircraft like the Bonanza, we typically practice accelerated stalls while turning. As I explain, the first step in any stall recovery is reducing angle attack. After the wings are flying again, you can correct the bank and return normal flight. To learn more about accelerated stalls, see other videos on my YouTube channel, including Accelerated Stalls from Steep Banks and Accelerated Stalls in the Vertical. 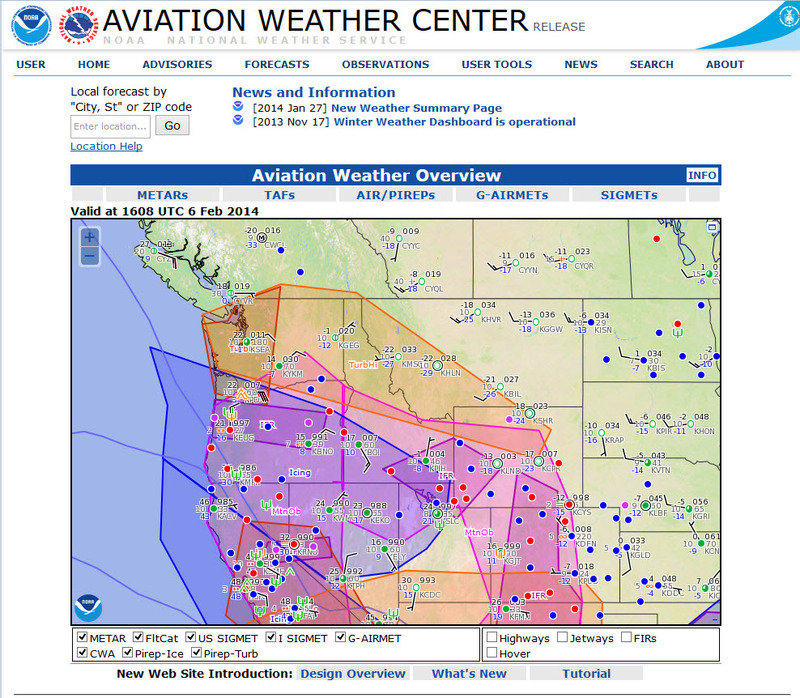 The National Weather Service has updated the design and features of its Aviation Weather Center website. You can read about the changes here; background on the new design is here.